Missouri FCCLA was founded in 1946. There are currently over 9,800 members in over 320 chapters across the state. Missouri currently ranks 5th in the nation for membership. FCCLA has a national membership of 200,000 young men and women in nearly 5,500 chapters. There are 50 state associations including Puerto Rico, and the Virgin Islands. Since its founding in 1945, FCCLA has involved more than nine million youth. Former members are eligible to become members of Alumni & Associates. 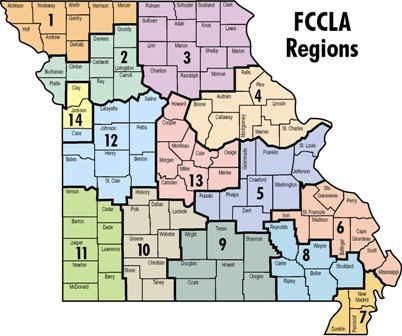 Missouri is broken down into 14 regions. Each region has its own executive council which includes one state officer.